You can easily calculate the costing for vendors and customers using SAP CRM Pricing. What this feature does is help you calculate the business transaction costs that are related to product quotations, sales, and service orders. The flexibility of SAP CRM Pricing can be gauged by the fact that you can define various conditions that will have an impact on pricing like surcharges, taxes, discounts, etc. 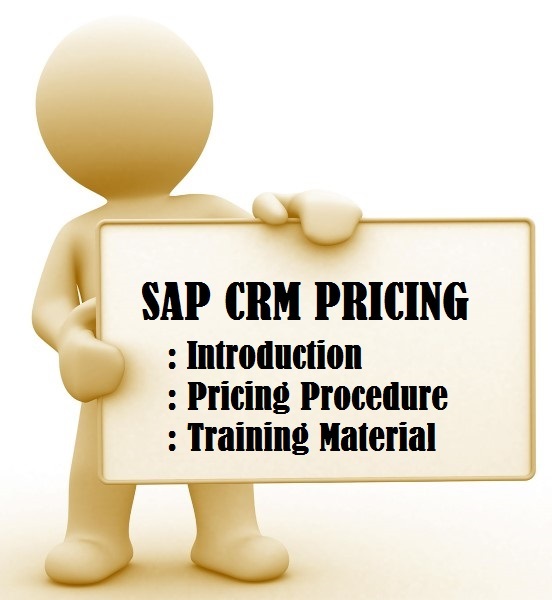 The organization that uses SAP CRM Pricing module makes use of condition technique to find out the pricing for all the involved business transactions. For the purpose of pricing determination, SAP CRM uses the Internet Pricing and Configuration IPC that is a sort of Java-based application. Different factors are considered while determining the pricing like date, order quantity, customer, and product. All these factors are taken into consideration for determining the pricing for the customer and the same is stored in the master data for future needs. Pricing procedure is what determines the pricing in SAP CRM and for this there has to be a source. Creating a Pricing procedure is simple. All you need to do is visit ‘Customer Relationship Management’ under ‘SPRO’ and then select ‘Basic Functions’. Once you are here, select ‘Define Settings for Pricing’ under ‘Pricing’, followed by ‘Create Pricing Procedure’. Remember, the Pricing procedure needs to be setup manually and not otherwise. To understand the attribute and characteristics of a condition the Condition type is defined. You can use this for determining the condition category, scale base, calculation type, and how it has to be used. What’s more, the Condition type can be used for defining the discount, surcharge, and price type for every condition. A condition type that determines the CRM system’s search strategy is Access Sequence. A condition table is used for defining these accesses. The priority of the individual condition records is determined by the Access sequence. Once a valid condition record is initiated, the system starts searching based on the sequences of accesses. To create Access Sequences, you need to select ‘Customer Relationship Management’ under ‘SPRO’. Thereafter, you need to select ‘Define Settings for Pricing’ under ‘Pricing’, followed by ‘Create Access Sequences’. CRM Billing can be used for generating invoices that can be related to any transaction in SAP CRM. It is for this reason the CRM system is directly connected to the ERP system for processing bills and other like tasks. Typically, CRM Billing consists of these steps – Input processing, Billing, and Output processing.